BPCA originated and still participates in this spring event now coordinated by the Wisconsin DNR to remove trash and litter from Lake Onalaska and the Mississippi River. Traditionally scheduled for the last Saturday in April, with a flood/weather reschedule date in May. On cleanup day, BPCA staffs the upper Brice Prairie landing to coordinate cleanup volunteers and boats, and arranges for garbage pickup at the landing by the Town of Onalaska. Pastries and drinks are donated by Consumer's Bakery. For River cleanups, volunteers are asked to meet at the upper Brice Prairie boat landing by 8 am. Bring warm clothing, boots, and gloves (for picking up wet items). 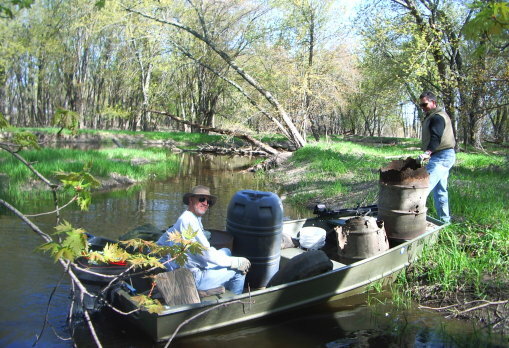 For the next cleaup, we hope to be expanding our efforts upriver into the Long Lake area near Trempealeau.